At Cash4Coins it’s simple… WE BUY EUROS! If you have collected some Euros from business trips or holidays abroad then we will buy them. Unfortunately UK Banks will NOT exchange Euro coins for sterling because of the huge logistical and operational challenges that repatriating and sorting Euro coins present. In a nutshell, we buy Euros and all foreign coins. Our teams are experts when it comes to sorting and counting your coins and we have helped many of our customers to make use of their otherwise useless foreign money. If you are not planning on using your currency in the near future, send it to us so that you can make use of the Sterling now. You are never obligated to sell your currency to us. We buy Euros in any denomination and would be delighted to help you today. 3. If you’re happy with the valuation we’ll pay you directly into your nominated bank account. And what’s great is that if you’re not happy with the valuation then we’ll return the coins to you at our expense. This is our 100% satisfaction guarantee. Not only do we buy Euros but we will buy any foreign currency. So why not get together with friends and colleagues and donate your leftover foreign coins to charity, your local school or club. It’s a great way to raise funds and all you need to do is collect the euros and send to us. Why not have a special foreign coin charity donation box? Or if you are a school why not ask pupils to ask their parents for foreign coins – not only will you be making money but the children will also learn about different coins and where they come from. It’s a great idea for a school project! 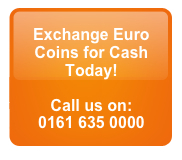 Contact us today and remember we buy euros and in fact ANY currency… so why not liberate those unwanted coins and notes today! You’ll be surprised just how much money you can make from those coins you have hanging around and we would be delighted to take your coins off your hands and give you a great rate of exchange. Speak to our team today to find out more. We also offer free help and advice on fundraising as well as hints and tips to make your a big success. We’re trusted by companies, hospitals and charities across the UK to help with foreign coin collections. Contact our team today. For details on how to send us your euros please go to ‘how to send us coins & notes’ page. We would be delighted to help!